Beauty trends are overwhelming, there are many and some are just too odd (remember oil pulling?!). Most tend to be makeup related, however a recent one that has caught my eye is multi-masking. Now what's that about? It's basically using multiple face masks together. I've been seeing everyone and their dog talk about multi-masking and of course, I tried it out. Multi-masking is not as gross as it sounds, you're not mixing various masks up and slapping them on your face (eww)! I have heard people say that’s what they thought it was! You identify the concern areas of your face i.e. dry forehead, oily t-zone etc and apply the masks only to the section of your face that needs it. It actually sounds like a great concept to me. Many times I'd have blemishes and apply a mud mask only to have my forehead feeling completely dry afterwards! I’ve tried multi-masking a few times. It’s certainly an odd feeling – the feel of different textures, formula, different fragrances. I would suggest teaming up masks that aren’t all heavily fragranced. My skin concerns usually are oily and some blemish around t-zone and jawline, dryer on my forehead and a little dull/sallow around my cheek contour. Obviously it varies seasonally but this is my current face map. My overall skin type is oily/combination so this is usually my main focus when it comes to treatments. This means I have a lot of clay masks! Clay masks generally contain some form of clay mainly white clay (AKA Kaolin) or French green clay. They are both great for oily, acne prone skin. They work by drawing out impurities and clarifying your skin. Also, look out for BHAs (beta-hydroxy acids) such as Salicylic acid; it is great for acne prone skin. It acts as an exfoliant as well as anti-inflammatory. 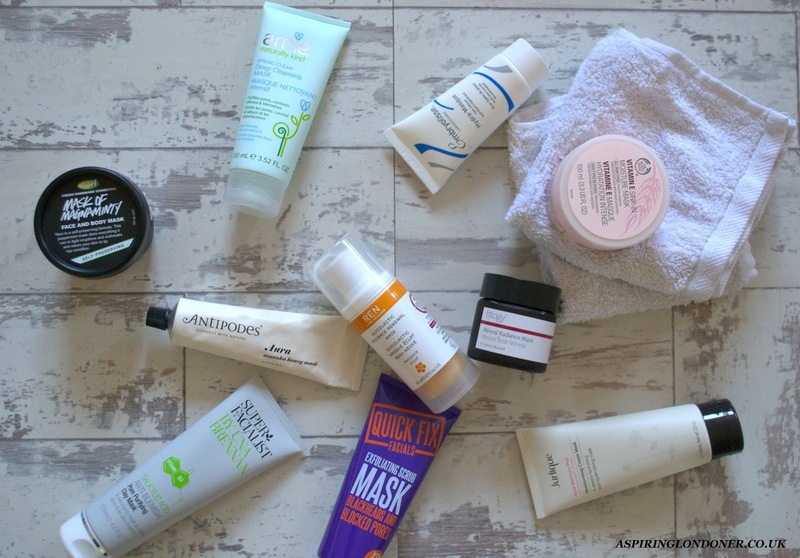 I’ve previously written a post about my favourite budget masks for blemish prone skin here. I also love using Lush Mask of Magnaminty (has kaolin) and Trilogy Mineral Radiance Mask (includes kaolin). Both has worked amazingly when I've suffered with breakouts. The Lush mask is especially great as it contains Aduki beans to gently exfoliate your skin to get rid of any dryness caused by beakouts. 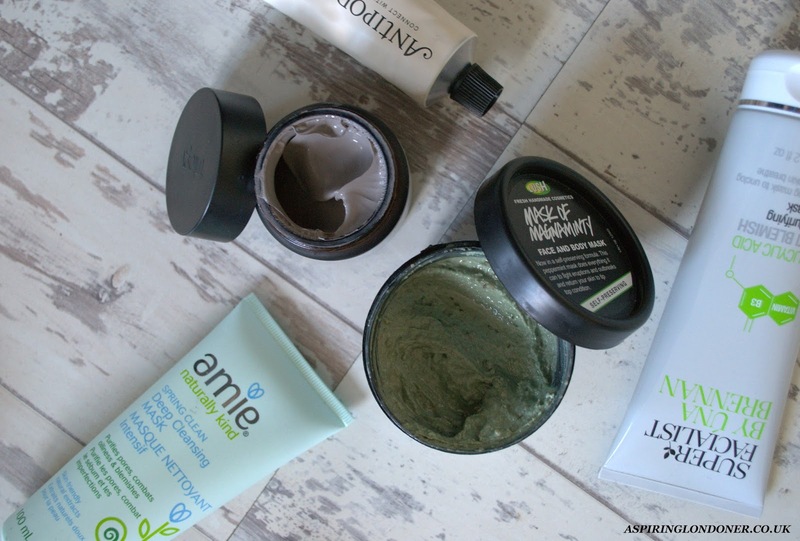 Another recent favourite has been Amie Spring Clean Deep Cleansing Mask, also contains kaolin and leaves my skin feeling really fresh and decongested! Although my skin isn’t generally the dry type, my forehead tends to get quite dry, no matter what the weather. I always have to take a little extra care of that area. This means I opt for quite a lot of moisture mask. You don’t necessarily have to have dry skin to use moisture masks either. Sometimes after you’ve had a breakout, the skin around the breakout can be dry – moisture masks would be perfect for these areas. I tend to look for humectant ingredients like glycerin. Humectant ingredients retain moisture and thats how they help your skin stay hydrated. 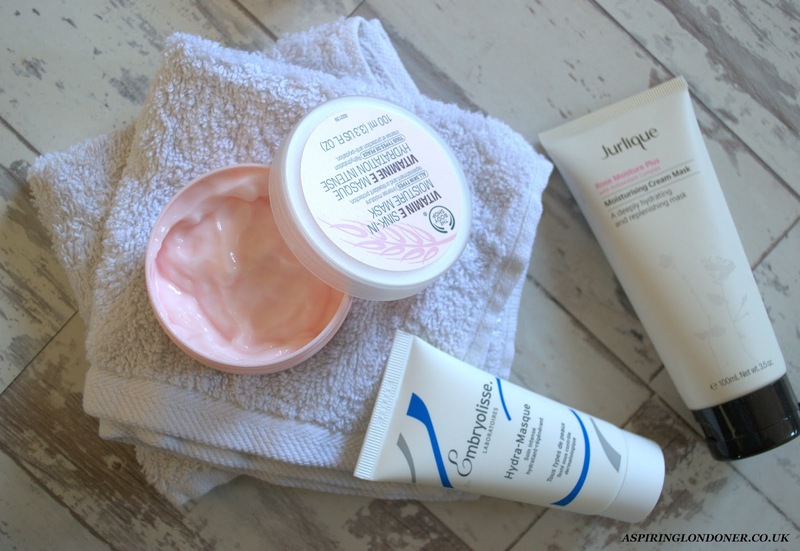 My most used hydrating masks right now are The Body Shop Vitamin E Sink In Moisture Mask, Jurlique Rose Moisture Plus Moisturising Cream Mask and Embryolisse Hydra Masque. Blemished skins welcome all kinds of problems, I find. You end up with dry/sallow or if you’re unlucky further blemishes! To address these issues and just to exfoliate the top layer of your skin, brightening masks are a great step. I look for AHAs (alpha-hydroxy acids) in the ingredients of brightening masks. 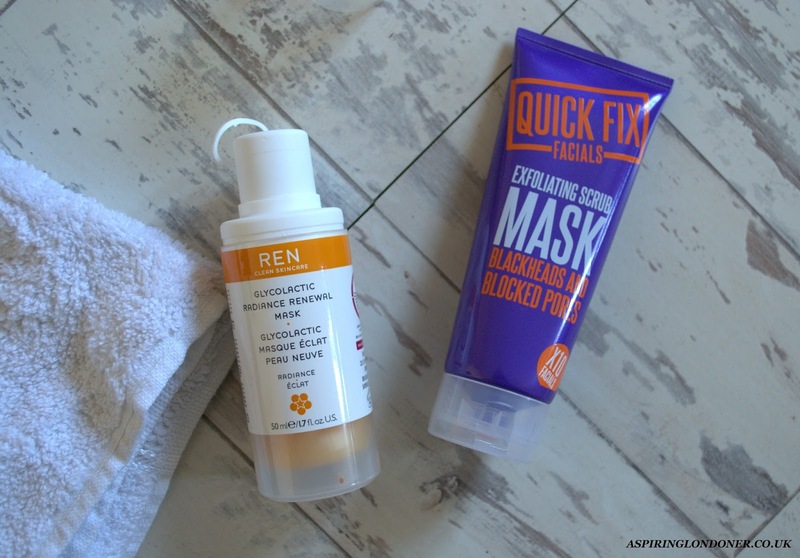 For example, REN Glycolactic Mask has AHAs to brighten, as does LUSH Brazened Honey face mask. Bear in mind, ingredients such as papaya, lime, pineapple extracts basically means the products have AHAs in them. Quick Fix Facials Exfoliating Scrub Mask also contains glycolic acid and is kinder to your purse strings! I really enjoy multi-masking as I find it saves time. I don't have to spend twice as long to address my skin issues. Also, the process of picking out masks from my stash is such an enjoyable process! It adds to the fun feeling of a pamper session. Have you tried multi-masking? What are your thoughts? Share recommendations in the comments below or tweet me @aspiring_london!